The aircraft was lost in July 1943 while on the strength of 4./JG 54 (? ), found in 1989 in a Russian forest and restored in the UK and latterly the US. Engine run videos and pictures of the first flight at the link below. 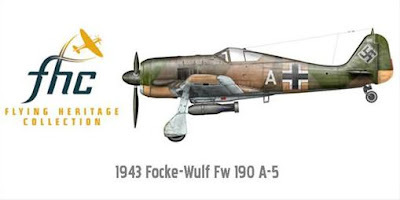 On Monday 19th July 1943 Fw190 A-5 W.Nr 1227 'White A' took off on a sortie carrying a SC250 (550Ib) bomb. Airborne from Siwerskaja in a Rotte on what was probably a hot summer day, 'White A' headed for the front line which was only fifteen or so minutes flight time away. Crossing the front line over the Dvina River, the Fw190 headed East, accompanied by the other machine. Whilst behind enemy lines, in an area called Voibakala, the 'Rotte' attacked an armoured train and reportedly suffered damage from flak. The loss report indicates the Fw190 crash landed due to this damage, although none was located on the airframe. 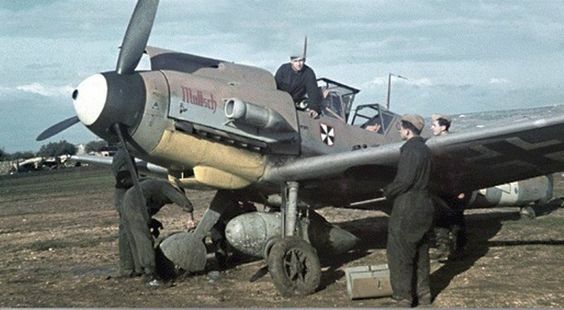 It would appear that the Fw190 suffered a catastrophic failure of the BMW801, caused by a rag -sabotage is suspected as it was a new engine only fitted a few days before. The Fw190 was recorded as being 100% lost in the map reference co-ordinates of Pl.Qu.20124. This grid system based on 1:200,000 maps was used to identify crash sites, possibly for salvage, recovery of missing pilots or as the best way of identifying an area consisting of unpronounceable Russian towns, villages and large areas of forests and lakes. The more numbers the Pl.Qu. reference gives, the smaller the area of the location. The pilot Feldwebel Paul Rätz survived the crash landed behind enemy lines. He removed his leather flying helmet and retrieved the first aid kit from the rear fuselage and is thought to have headed West back to the front line only a dozen or so miles from the crash site. He was undoubtedly captured by the Russians and interned although the Luftwaffe loss report still classes him as 'Vermißt' (missing) in action. This article -which has appeared in a number of places over the web uncredited- was prepared by Mark J. Sheppard and is reproduced here with Mark's kind permission. 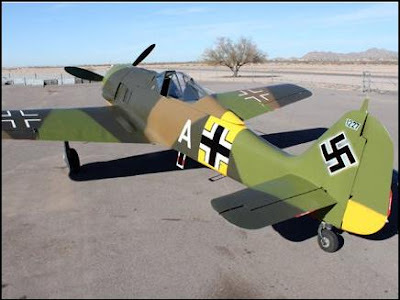 In addition to documenting the original colours and the early restoration efforts, Mark undertook much research on the pilot (aided by Axel Urbanke in Germany). The pilot survived the crash landing and became a POW – returning to Germany in 1949. Paul Rätz died in 1989. Originally a ground crew member before becoming a pilot, Rätz flew with 1./JG54 and Nowotny during 1942-43. He had survived three crash landings, returned a number of aerial victories and been awarded the Frontflugspange (Front line or combat pilot's flying clasp ) in bronze, silver and gold for over one hundred sorties flown. He was transferred to 4./JG54 on 9th July 1943 and reported as missing ten days later - the BMW 801 engine having suffered a catastrophic engine failure. The 190 came down in a sapling forest which then grew around the aircraft so that 40 years later "you could not see it from 20 feet away". The recovered airframe was 99% complete including ammunition boxes as well as the remains of the pilot leather skull cap on the seat. It was only missing two MG-17 machine guns, a few instruments and the master compass.